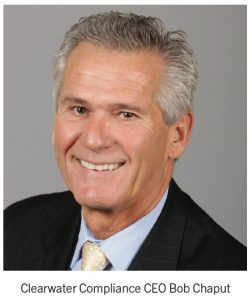 Clearwater Compliance CEO Bob Chaput, a recognized leader in the field of cyber risk management is co-author of a chapter in the recently released book titled “Health Care Risk Management Fundamentals” published by the American Society of Healthcare Risk Management (ASHRM). This comprehensive book is an authoritative insider’s perspective on best practices for hospital risk management, providing a complete introduction to risk management in health care and addressing today’s greatest challenges to patient safety. Chaput was part of a national team of experienced health care risk management professionals who worked together to create this publication. Chaput’s chapter, “Technology and Data in Healthcare,” presents an innovative and judicious approach to the intersection of patient care and technology as more patient care is moving out of traditional health care settings and into the home and workplace. It provides timely, tangible, and specific actions that risk managers can take to improve their information and technology risk management posture. Included is background on the digitized health care ecosystem in systems, devices and applications. The book was released October 15-18 at the ASHRM annual conference in Seattle, Washington. It is intended for hospital risk managers, CIOs and CISOs interested in better understanding the need for and implementation of a comprehensive risk management process and approach that encompasses the entire organization. It will also be of particular relevance to a broader academic audience as a comprehensive textbook, providing a complete introduction to risk management in health care.